In line with management philosophy of “Customer First - By Your Side, For Life,” we strive to develop Total Life Plan Designers whose broad-based knowledge enables them to provide effective advisory services, and who are able to provide ongoing support for our customers in line with customer needs as perceived by the customers themselves. The cultivation of knowledgeable, highly-skilled personnel is a key source of competitiveness and productivity enhancement for our company. To facilitate the implementation of cultivation and training that is aimed at inculcating a high level of specialist expertise and ancillary know-how, as well as the enhancement of inter-personal skills, we are committed to strengthening our development planning, organizational framework, and instructors. In order to be able to provide advisory services that meet our customers' needs, we are committed to strengthening our human capital development program, our organizational structure, and our instructors' capabilities. While working to strengthen the integration of human capital development and market trends by developing cultivation activities and guidance suited to the special characteristics of the market, we are also working constantly to enhance the level of assistance and support that our personnel provide by basing personnel evaluation not only on sales performance, but also on the quality of service provision after a policy has been taken out, obtaining of external qualifications, and other factors. After first being hired, new employees undergo concentrated development by learning basic sales activities, product knowledge, proposal skills and knowledge about safeguards through placement in a specialized organization. Even after beginning their sales work, employees receive an orientation led by specialized in-house staff, undergo daily training through OJT led by sales instructors, and curriculum that is combined with e-learning. Later, progress of each individual's professional development is confirmed and a five-year development program follow-up structure is in place that involves stratified training for even greater growth. All told, Dai-ichi Life's approach to human capital development is carried out over the long term. Once personnel have completed their initial intensive training period at the training center, they continue to receive ongoing education and training that is coordinated between the head office, branch offices and individual unit offices, with the aim of furthering enhancing their knowledge and skills. Besides knowledge and skills training, the intensive training provided at the branch office level also includes the sharing of sales-related ideas (from a customer-centric perspective), thereby helping to enhance the overall level of sales activities. At the unit office level, besides the provision of day-to-day guidance and on-the-job training by unit office instructors, a bottom-up process of “growing together through collaboration” based on our company's unique team system helps to reinforce the results of training. From the third year onwards, there is an enhanced level of segmentation and specialization in the training topics and training subjects, with education and training centered on stratified training implemented on the basis of the Total Life Plan Designer's level and activities, etc. In addition, Dai-ichi Life provides ongoing education and training system using web-based training and e-learning, which helps Total Life Plan Designers to develop and strengthen a wide range of skills and know-how. Education regarding appropriate payment of insurance benefits, etc. ●Provision of information when customers have completed the procedures required for taking out a policy, etc. ●Basic grounds for payout, etc. ●Consulting relating to the social security system, etc. ●Handling of data relating to insurance solicitation, etc. ●Handling of personal information, etc. ●Behavior that is prohibited by law, etc. Head Office group training programs were developed for Total Life Plan Designers selected from Dai-ichi Life's nationwide network in order to provide advanced training on customer needs and customer services. 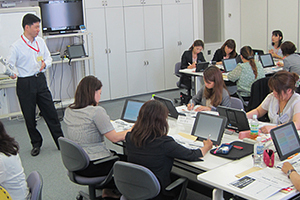 In addition to Higashi-Totsuka Training Center (Kanagawa Prefecture), where the Head Office group training program is held, practical training centers responsible for orientation have been set up at approximately 180 locations at branch offices and sales departments and here training staff work to develop Total Life Plan Designers. In addition, training staff are provided with regular access to Head Office group training and web-based training programs. Furthermore, best practices are also shared among staff to establish a high quality training system. 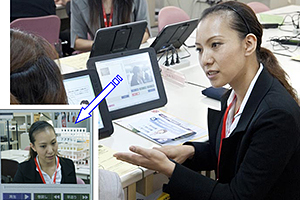 Dai-ichi Life has also introduced a web-based training in an effort to expand audiovisual learning opportunities. Dai-ichi Life is actively encourages employees to take The Life Insurance Association of Japan recommended tests and external accreditation exams in an effort to enhance their ability to propose insurance solutions to customers by acquiring a broad range of advanced and specialized knowledge about the industry. In particular, we encourage employees to take and obtain accreditation through the specialized and applied course tests established by The Life Insurance Association of Japan and the nationally administered certified financial planner skills exam. A support system is in place to help employees obtain such accreditation, which includes group training led by specialized staff and the provision of various learning materials. The DL Pad, a tablet computer for sales and business use, contains an e-learning system. This system provides explanation guidance for customers and an on-camera role playing feature where employee can record and check their own explanation. A test feature is also provided to check learning progress. This system is used for various training and professional development.